First time, we watched new movie which have all race's unity! 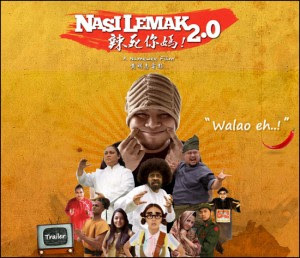 This film also directed by Namewee, Malaysian! The story really is quite good and comedy too! I think that this movie teach you a lot of meaning about how to understand all race; how Melayu, Chinese and Indian can be united and can stay so together in 1Malaysia! Summary Story: Young Chef Huang (Namewee) struggles to get his restaurant business going because he cannot adapt to the 'localized' cooking his patrons are looking for. However, contradict to his unpopular cuisine, he is also well-known as 'Hero Huang' in the local neighborhood where he carries out good deed in helping the community until he met Xiao K (Karen Kong) who got him into deep trouble. In order to get his life and the restaurant business back on track, Chef Huang must now seek help from a mysterious hawker stall lady (Adibah Noor), who summons him to embark on the extraordinary journey of his life. During this self-enlightening experience, he will also meet many 'local heroes' each lending their support to help him re-discover his roots and the real hidden message of 'Nasi Lemak'. Wow, for example, a malay aunt, Noor who take a Chinese girl as god daughter! A malay can learn Chinese in primary school! Aunt Noor can learn yinyang martial arts! It is very cool! I really like hero Noor! A Indian and Chinese can live as family and friend when Hero Huang and his friend are on the jounery to 3 different places to learn our culture, Nyonya, Melayu and Indian so he learned about what is the important of meaning about this! Finally, Chef Huang understand 'Nasi Lemak' and want to make his creation dish with 3 cultures be together! We no need to see what skin of races and should help each other so we can live so harmony and peace in Malaysia! For example, when we live together, we eat together, there is no racism. That is why it increase the awareness of what happening in Malaysia toward the younger generation today. I think that this movie is just simple but, it is good to make you understand what is the meaning about 1Malaysia!